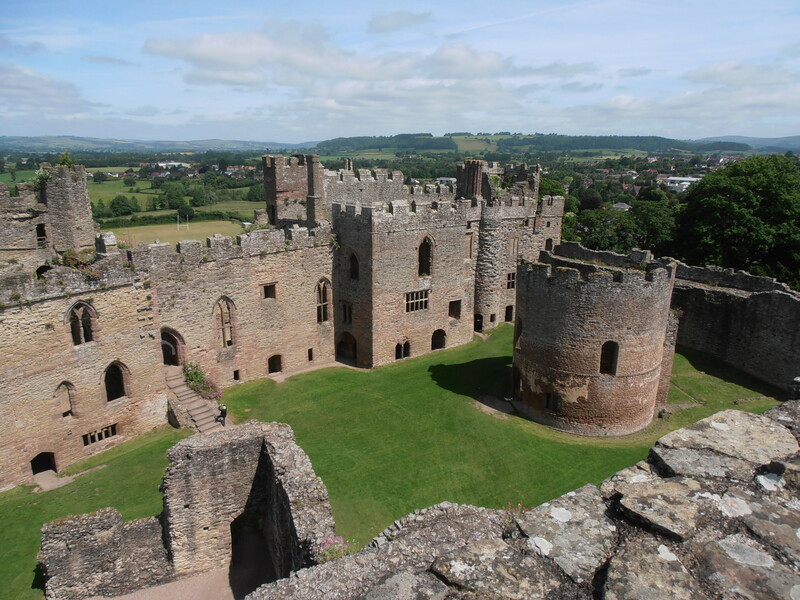 Elizabeth was born in 1371 in one of the Mortimer castles in the Welsh Marches, probably in Usk where Roger her eldest brother was born, or in Ludlow where her younger brother and sister were born. She was daughter of Edmund Mortimer, 3rd Earl of March, and Philippa of Clarence, grand daughter of King Edward III. A bird’s eye view of Ludlow Castle which Elizabeth would have known very well. Elizabeth married Sir Henry Percy (Hotspur) heir to the Earl of Northumberland when she was 8 years old. Hotspur was 15 years. They had two children together: Henry and Elizabeth. As a daughter of Philippa of Clarence, Elizabeth was caught up in the Mortimer claim to the English throne. Her grandfather, Lionel of Clarence, was the second surviving son to Edward III which gave the Mortimers a significant claim before Henry IV, whose father John of Gaunt, Duke of Lancaster, was the third son. Except that the Mortimer claim was through a female line and had been disinherited by Edward III in his final days. Elizabeth’s young nephew, Edmund Mortimer, was Earl of March but was kept confined in Windsor Castle by King Henry IV who was well aware of the Mortimer threat. 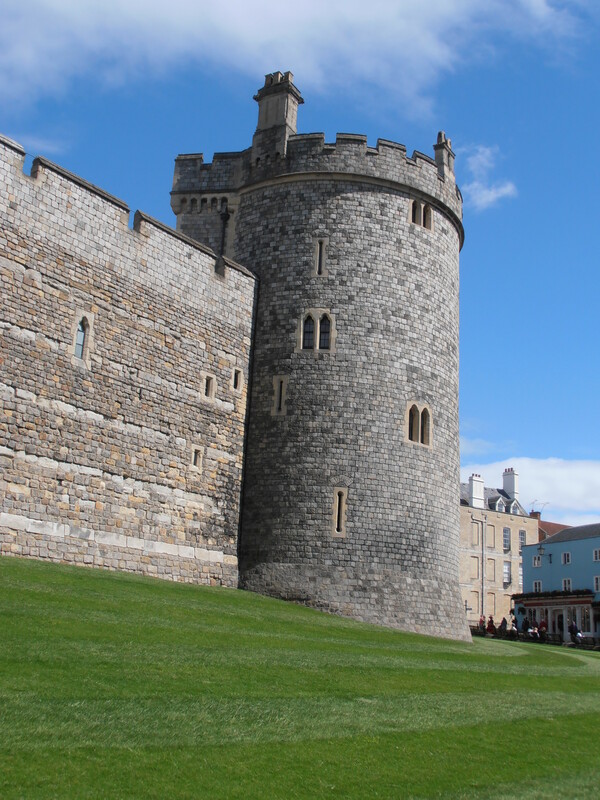 Here are some of the impressive walls and towers at Windsor, perfect for keeping dangerous subjects incarcerated. Elizabeth’s brother Sir Edmund Mortimer, head of the family in the Welsh Marches while his young nephew was imprisoned by the King, was defeated at the battle of Bryn Glas and taken prisoner by Owain Glyn Dwr’s forces. He was kept a prisoner by Glyn Dwr when King Henry refused to ransom him. 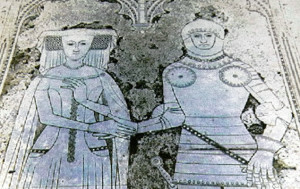 Elizabeth, through family connection, was at the centre of the agreement between the Earl of Northumberland, Hotspur, Owain Glyn Dwr and Sir Edmund Mortimer to rise in rebellion against the King. Eventually they would decide to divide England into three between Glyn Dwr, Northumberland and the Earl of March. 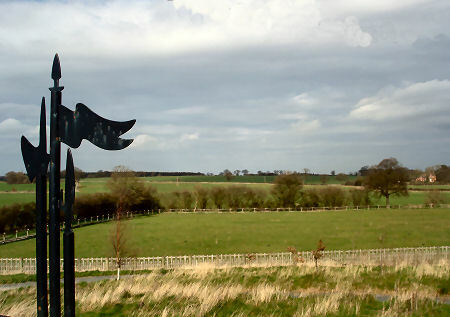 Hotspur was killed on the battlefield at the Battle of Shrewsbury in 1403, fighting against King Henry IV. This is the battlefield at Shrewsbury as it is today looking east. Elizabeth’s son Henry, heir to the earldom of Northumberland, was sent by the Earl into exile to the royal court of Scotland to keep him out of King Henry’s hands. Her daughter Elizabeth was married to John Clifford, Baron Clifford, and then to Raplph Neville, 2nd Earl of Westmorland. Jane Seymour, third wife of Henry VIII, was descended from Elizabeth Percy and John Clifford. Hotspur’s body, quarters of which were exhibited around England after the Battle of Shrewsbury, his head displayed on Micklegate Bar in York, was formally delivered to Elizabeth by King Henry for burial, probably in York Minster in an unmarked grave. 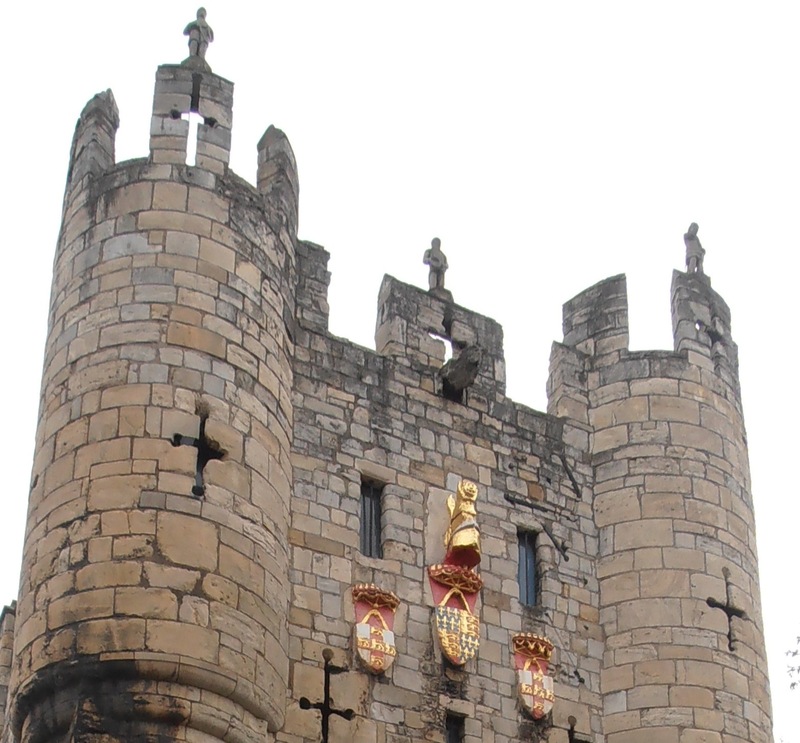 This is Micklegate which has displayed any number of famous heads. As a potentially dangerous widow, Elizabeth was remarried to Thomas, Baron de Camoys in 1406, a close friend and counsellor of the King. She had a son with him, Roger. 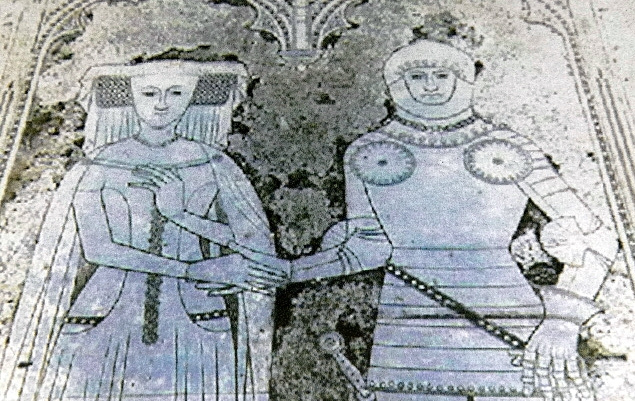 Elizabeth pre-deceased Thomas de Camoys and died in 1417 at the age of 46 years and was buried in the Church of St George at Trotton in Sussex, with a fine brass showing them both, hand in hand. Elizabeth starred with Hotspur in Shakespeare’s Henry IV Part One and briefly in Part Two. Shakespeare calls her Lady Kate. So little we know about Elizabeth, only this outline of her life. Here it is interesting to use a little historical speculation. How did she feel about the divisions in her family when the Percys initially supported Henry while the Mortimers were resurrecting their own claim to the throne? What influence did she have on her household when Hotpsur broke with Henry and made an alliance with Glyn Dwr? I am certain that, being a Mortimer, Elizabeth was not a silent presence in those days of insurrection, and ultimately tragedy. Read all about it in Queen of the North. Published 31st May 2018 as Hardback and eBook. Thank you for these interesting facts Anne!! I am fascinated by Elizabeth Mortimer and Hotspur, and their story, in Queen of The North, moved me to tears. It is an incredible story of love, passion, ambition, and ultimately, tragedy, and you have painted their picture with your words so beautifully. Love them!! I really enjoy your books and have read most of them although not this latest one. I like learning about new people. I dislike too many inaccuracies which some novelists provide but your books seem very well researched. I am very much looking forward to reading this book. Thank you for all you write about. I never tire of reading all I can about medieval history, and you make it come to life. I feel that I am living in the period I am reading. A sign of a very good author. Looking forward to reading more of your great books in the future.